Sage Dining Rooms is accessed through Mint Garden Bar. Photos: Maryann Mussared. I am a long-time fan of heritage Gorman House Arts Centre, and Sage Dining Rooms and Mint Garden Bar has established itself as a well-loved, popular part of this inner-city creative arts precinct. Located in Braddon directly behind the demolished ABC flats and Canberra Centre, Gorman House was built in 1924. It was originally, rather unimaginatively, called Hostel No 3, before being renamed Gorman House in 1927 after Claire Gorman, a senior public servant who died suddenly that year. Built as accommodation for public servants coming from interstate, as there was so little housing available, the compact individual bedrooms were built between the cornerstones of the complex: a series of lounge and dining rooms. After the hostel was ‘decommissioned’ in the 1970s, it became home to a number of theatrical and visual arts organisations and practitioners and is now part of a buzzing inner-city creative hub. The former communal dining and living rooms have been repurposed, and one now houses the quietly elegant but relaxed Sage Dining Rooms, while the informal Mint Garden Bar sits casually in a wide breezeway between two buildings. The main dining room of Sage fits well in the heritage building. 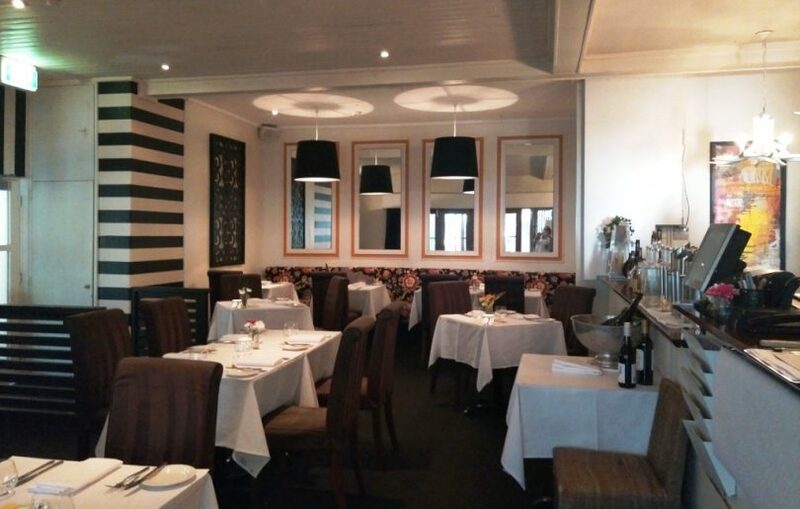 Sage Dining Rooms isn’t just a quality dining establishment; it is at the heart of Gorman House and walking distance from the centre of commerce in the capital. It is also adjacent to the inner north suburbs, which means it is an easily accessible eating spot for many. Visitors include city workers, local residents as well as interstate visitors who come for the excellent and innovative food as well as to enjoy the heritage setting. Shady walkways join the buildings that makeup Gorman House Arts Centre. A recent return visit to Sage was made all the more enjoyable by the anticipation of a cocktail in the Mint Garden Bar. However, as has happened occasionally this summer, the weather got in the way of that plan. The last time I ventured into the Mint Garden Bar to meet a friend, it was a very busy Friday afternoon and we had trouble squeezing into the popular outdoor bar. More recently, it was unseasonably cool, and being mid-week, the bar wasn’t so busy. Despite the offer of a heated canopy outside, the Garden Room and main dining room beyond looked inviting and was already buzzing. As one of the evening’s early arrivals, I was greeted warmly by the front of house manager and quickly settled into a comfortable corner table and offered a drink. I am not a great cocktail drinker, but asked the advice of one of the professional staff and decided to sample the current ‘popular’ cocktail. Cocktails @ Sage and Mint. My choice of a “Moscow Mule” was an excellent one. 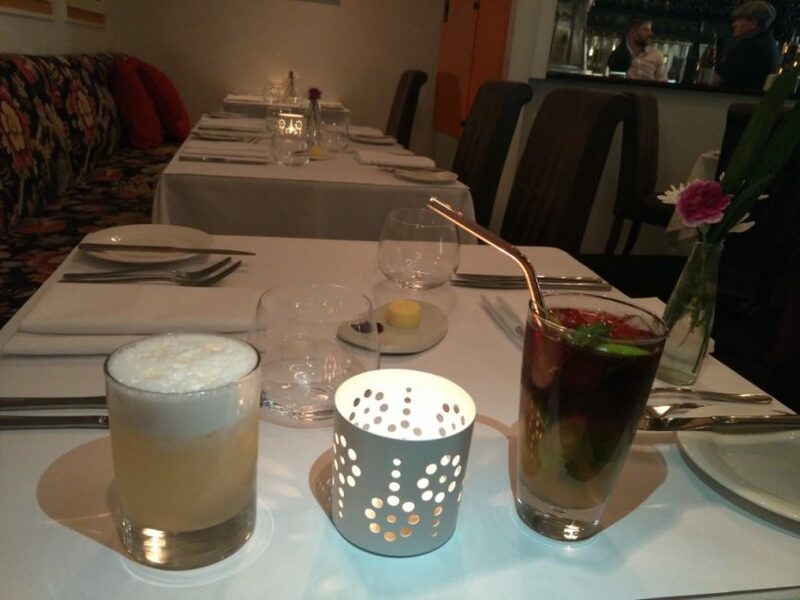 Vodka, ginger, Sangiovese and sour rosewater syrup, and the addition of a metal recyclable straw was a nice touch. My companion had a perfectly soured “Whiskey Sour”. We munched happily on always perfect Three Mills sourdough and in-house butter with Tasmanian pepperberry-infused salt, and soon felt ready to order. Chef Thomas Heinrich has created a menu that is well worth travelling for, although it was interesting the evening I dined, the restaurant was full of relaxed locals who seemed to know their way around the menu. Apparently, over the holiday period, things had been different with a lot of interstate visitors in town, who had sensibly found their way to a really interesting part of inner north Canberra. 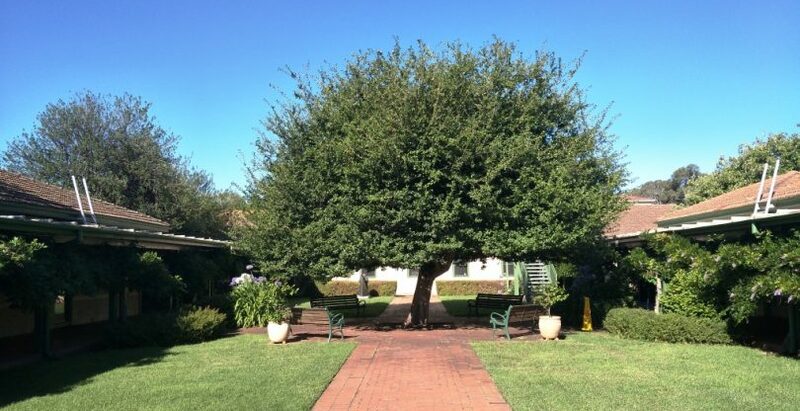 Gorman House is in a lovely setting and the old wisteria that shades the courtyards is famous, and on the warmest of evenings, there is a cooling breeze. The summer menu was full of delicious ingredients that appealed immediately. Set as a degustation, diners can choose from a three or five-course menu, set at a reasonable $75 and $85. I decided I would try the five-course menu and was offered a wine pairing menu for $45 or cocktail pairing for $65. However, after my cocktail, I decided to select a well-priced wine by the glass from an interesting wine list and a very sensible bottomless bottle of “Vestal” water that was aerated in-house. Sage staff is involved with food production from paddock to plate, with the intention of establishing a real connection and passion for the food and the processes that led up to the creation of the Sage menu. Expect contemporary Australian food that is light and subtly flavoured, with each course designed to have its own identity. 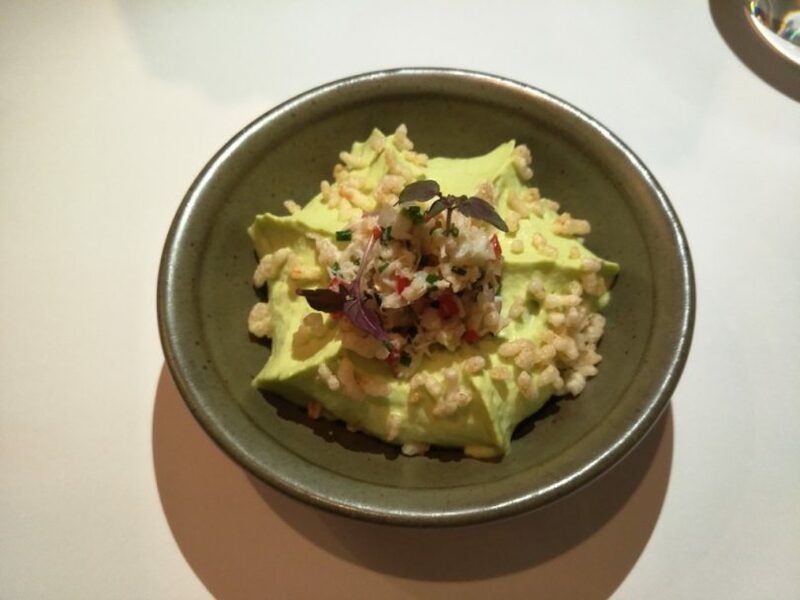 Intriguing amuse bouche of foamed wasabi cream with crab salad was a great start to a meal that required concentration. The small courses are trialled before they are selected to go on the menu. 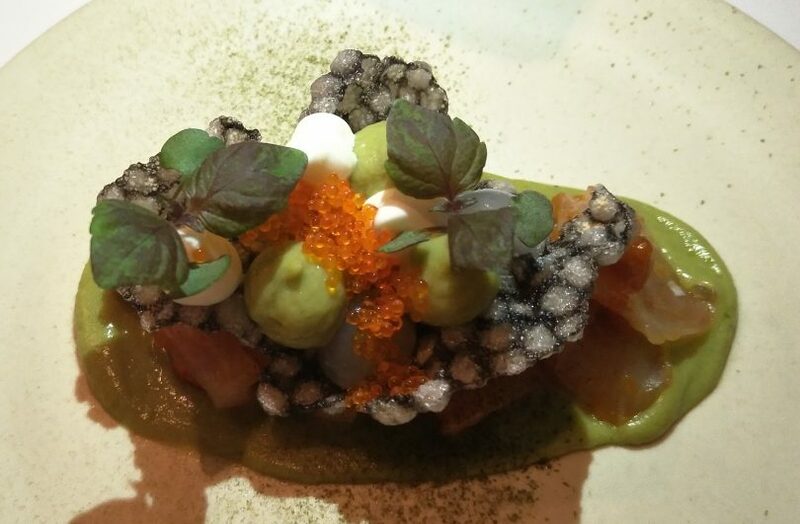 My favourite, the piquant King fish escabeche with avocado puree, lemon gel and sheep milk yoghurt with flying fish roe, nori powder and micro herbs had originally been offered as an amuse bouche, before being promoted to the main menu as a first course. 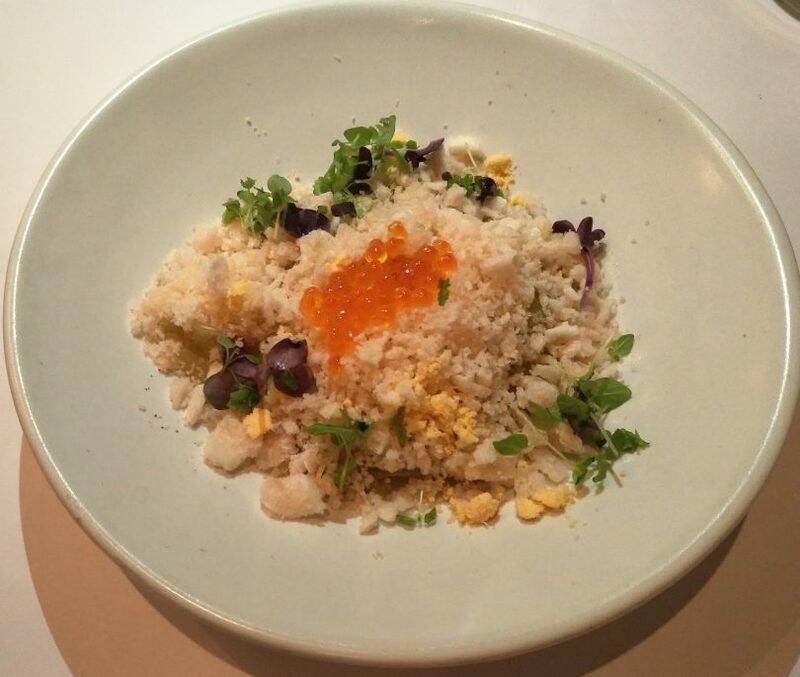 King Fish escabeche was formerly served as an amuse bouche but now features on the main menu. Another creative and individual dish was the prawns cooked in a light green curry sauce with garlic and ginger. Accompanied by caramelised crunch peanuts, rice paper with tamarind, and homemade prawn crackers and salmon roe, this was a dish I could have had on its own for a light lunch. A delicately flavoured prawn curry struck me as being a bit like a deconstructed Pad Thai. 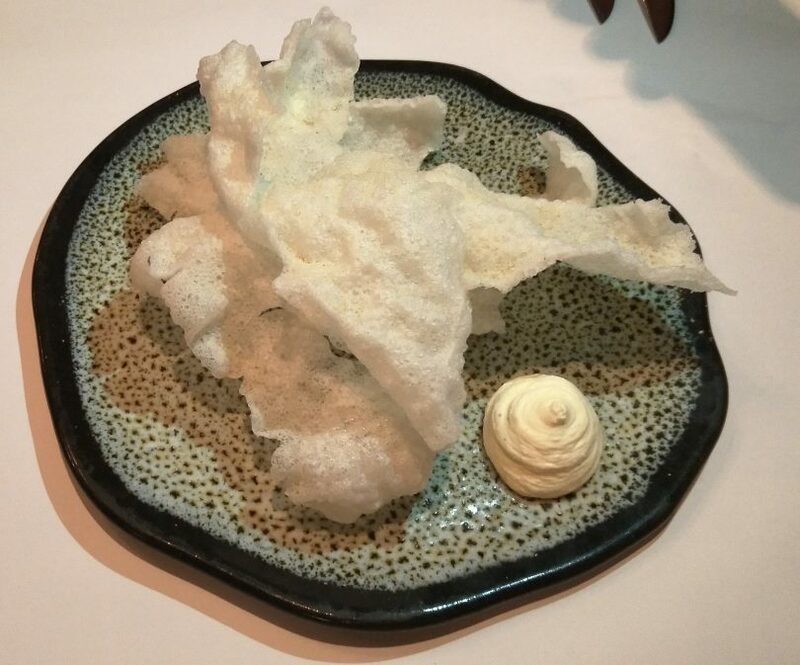 Homemade prawn crackers were served on a beautiful handmade plate. I immediately recognised the inimitable and beautiful glaze of local potter Chris Harford. 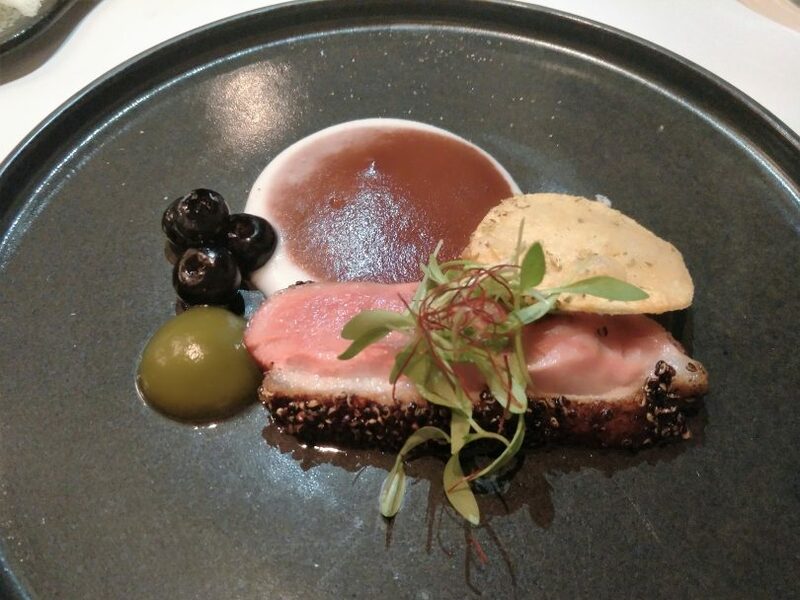 The most interesting dish I tried was a tender duck breast served with a Belgian chocolate mole sauce, coconut, red quinoa, pickled lime and a homemade tortilla. Duck breast with delicious chocolate mole sauce. I approached the chocolate sauce with some reservations, but it was completely delicious and I will definitely try this at home. A fresh and palate cleansing dessert was offered. 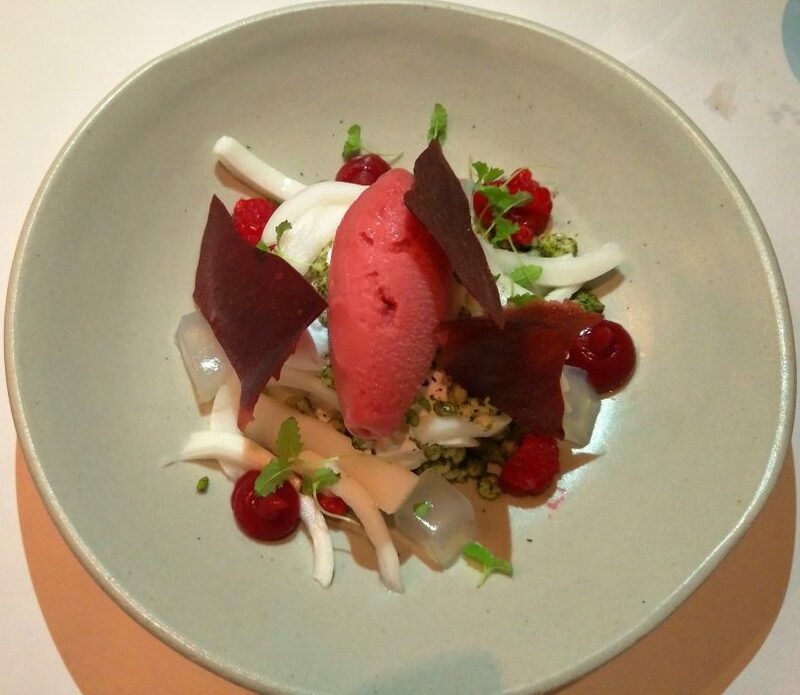 I admired the restrained use of sugar and the beautiful textures of the raspberry-based mix of fresh fruit, sorbet, mint dusted tapioca balls and fresh coconut foam. Refreshing raspberry and sorbet collation. 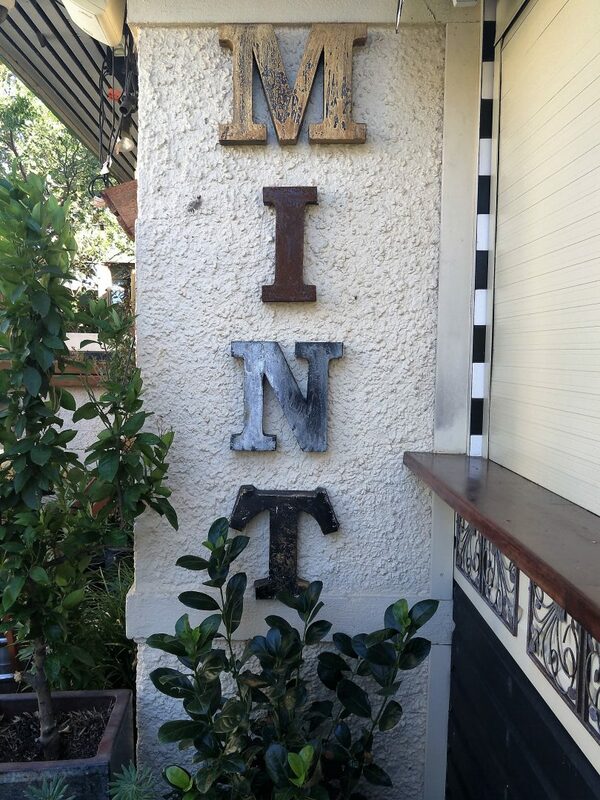 The recent addition of Mint Bar, an open-air garden room with recycled timber outdoor deck and a beautifully refurbished main dining room, makes Sage the perfect venue for a number of types of functions with an interesting and complete package of indoor and outdoor function options available. The outdoor courtyard that houses Mint is relaxed and offers an array of premium beers, cocktails and wines. 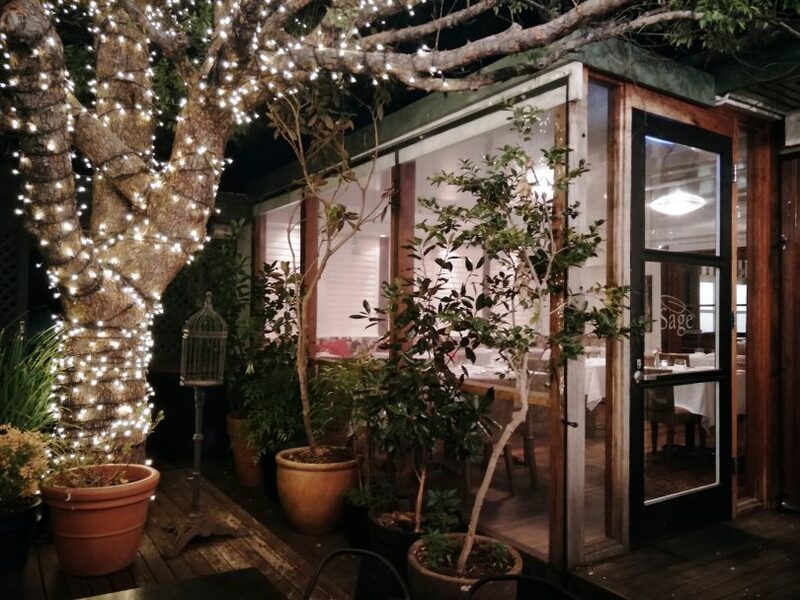 Gorman House is truly a tranquil oasis, and Sage offers a perfect chance to escape the nearby city for drinks in the courtyard. I can see the special dining experience provided by Sage and the more informal and relaxed outdoor environment of Mint appealing to a wide audience in Canberra and beyond. Sage Dining Rooms and Mint Bar is located on Batman Street, Braddon. It is open for lunch from 12 to 2 pm, and for dinner from 5.30 to 10 pm Tuesday to Saturday. During the day there is paid parking on Batman Street and plenty of free parking in the evening. You can book by phone on 02 6249 6050 or book online here. 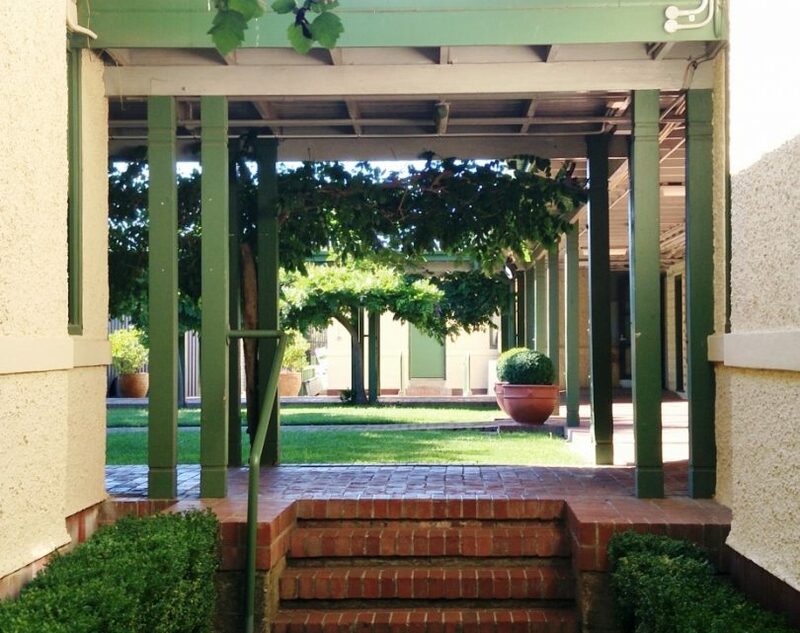 If you have a chance before dinner, take a walk around the shady courtyards of Gorman House. Maryann was a guest of Sage Dining Rooms.